We are doing it. We are getting out of debt. And while this process has seemed endless, we have been so diligent to pay off our student loans as fast as possible. I am pleased with our diligence and how far we have come. Thankfully, we do not have any other debt. We are not credit card users and are only renting an apartment right now. Our cars are paid for (though we will be needing a new one soon). Basically, if we can avoid more debt, we do. Debt enslaves you and prevents you from living your best life. I LOVED my college experience, but I don't know if I would say that it was worth the thousands of dollars of debt it brought, when there were cheaper options available. We had almost $100,000 in student loan debt. It's sickening. But we are on track to have it ALL paid off in August, which means it will have taken us 6 years to pay it all off. It has become so normal in our society to spend YEARS, even lifetimes, paying these things off. But it IS possible to pay them off quickly, even on a pastor and teacher's salary! Is it easy? No way. But it's possible. I love how Dave Ramsey says, "If you will live like no one else, later you can live like no one else." We are doing things a bit unconventionally. Technically, we are a two income family, but we are choosing to live on one income until we are out of debt. We have been married for eight years and have a little girl, but we are choosing to wait on our dream for a house and to live in a modest apartment. We are doing these things so we can have the FREEDOM of not owing anyone anything in the very near future! 1. Track your progress. Write down how much you pay off each month, either in a planner or on some kind of visual that you will see often. Progress provides more motivation to keep going and it will be exciting each month to see that number dwindle down. 3. Find some side hustles that you are passionate about. Chances are you're already working full time, so find some other ways to make extra income that are FUN! I worked a retail job during my first full year of teaching...it was hard, but every paycheck went to help us get out of debt. The company also offered a few free items that I otherwise probably wouldn't have bought due to trying to live frugally. It also offered a discount for when shopping was in the budget. Maintaining that second retail job wasn't realistic for me long term, but I'm glad I did it temporarily. Right now, I blog and am a consultant for Rodan + Fields, which are things I love doing anyway AND they offer extra income, discounts, and occasional free products. 4. Celebrate reaching milestones along the way. Determine the milestones that you want to celebrate. Whenever you reach that milestone, creatively and frugally celebrate that milestone. Make room for these celebrations/rewards in your budget! Maybe each time you pay off 10% of your debt, you take your significant other on a special date. Just find something to celebrate your progress so you will be motivated to keep going! 5. Accept that you are going to be "behind" for a little while. Getting out of debt as quickly as possible is going to require some sacrifice and intensity. You will watch everyone around you "move up" in their lives by buying beautiful houses and nice cars. You'll see them take regular exotic vacations. It can be hard to feel like you are behind. Don't fall in to the comparison trap. Everyone's journey is different. Plus, we only see a small portion of people's lives on social media. We have no idea what other struggles they have... I guarantee their lives are not all fun and games. The point is, we don't know, we can only focus on our own progress and goals. Society and social media will tell you that you're behind. Be okay with it for now. Remember that it is temporary. Live like no one else now so you can live like no one else later. Getting out of debt quickly is possible. Make it one of your top goals and don't stop until you get there. Trust me, if we can do it, anyone can. You just have to want it badly enough! 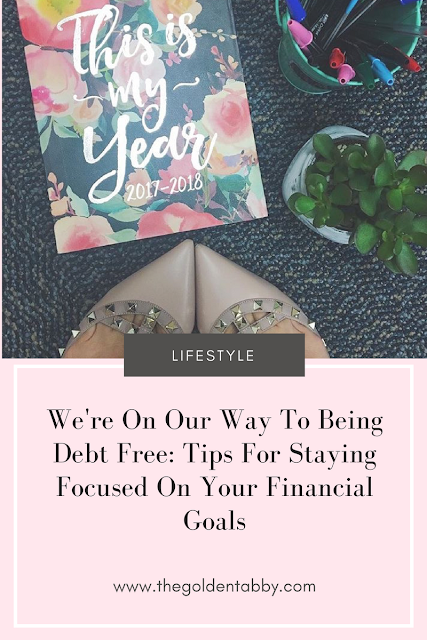 Do you have any other tips for getting out of debt? I would love to know! Thanks for reading! !